Glosa, an international language, is a modification of "Interglossa" by the late Professor Lancelot Hogben. It is designed to be easy to learn, with no complicated grammar and words which are already internationally familiar. Glosa does not aim to replace the Euro-languages - or the other 5000 or so languages of the world - but it should help those who wish to communicate quickly and easily and to co-operate with people from other cultures. It also offers many educational advantages. As the vocabulary is based on international Latin and Greek roots, it offers the added educational advantage of helping students to learn the vocabularies of the Euro-languages, and often stimulates them to start studying another Euro-language other than their own. 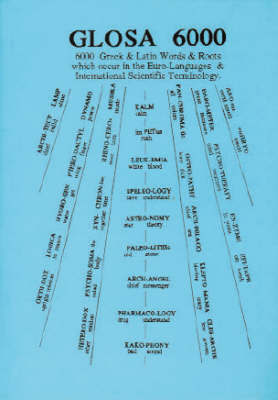 This dictionary gives the meanings of Greek and Latin roots used in medicine, biology, plant and animal names. It should be suitable for educationalists, students, linguists and Glosa enthusiasts.